Longtime San Jacinto College educator Kevin Morris, TRETA President 2012-2013, strives to motivate students to become independent, lifelong learners. 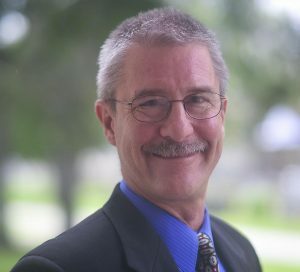 He teaches real estate at all three campuses, and also serves as interim dean of business and technology at the South Campus. Photo credit: Rob Vanya, San Jacinto College marketing department. Q: Why do you feel attending college is important, and why is earning a college degree also important? A: Lately it seems education has gotten a bad knock by some in the media who seem to imply that higher education is not so important. I do not buy into that notion at all. Higher education is more important now than ever, especially in the area of technical education, which is so specialized. We need a well-trained workforce and that’s only possible through education. And earning a degree – being a completer – says a lot about a person’s character. Most employers really like it. It shows that a person can persevere and can see things through to the finish. Earning an associate degree has become the new baseline that some companies now look for when hiring new people. Q: Some may feel real estate can be an uncertain career field because of fluctuations in the market. Is that really true? A: There is that perception, but the reality is not nearly as negative as the news sometimes portrays it. Yes, there are cycles and fluctuations, but that is true of many career fields. There will always be a need for real estate agents because people always need roofs over their heads, and people are always going to either buy, sell, or rent real estate. Many people think real estate involves just one area – residential brokerage. But there are many more areas of real estate – apartment locating, lending, investing, commercial and industrial transactions, appraisal work, etc. The field also encompasses real estate education and research. In fact, Texas A&M University has a large real estate research center. Q: What are the basic requirements to get started in real estate? A: Texas requires more education than most other states. A person must take at least six college classes (at least one semester) in order to qualify to take the state real estate exam. Also, if a person in Texas wants to start a real estate brokerage (an office that employs other agents), he or she must maintain a real estate sales license for at least four years, and earn the equivalent of an associate degree in real estate in order to qualify to take the broker’s exam. Q: How have you seen the real estate career field change through the years? A: I remember when computers started becoming prevalent in the mid and late 1980s that some predicted that computers would someday replace real estate agents, but it has not happened. Computers and the Internet have enabled real estate clients to become much more knowledgeable because they can do a lot more research. But when it comes time to sign contracts on big ticket items such as real estate transactions, people still want the security of dealing with a well trained, experienced real estate agent who knows current real estate laws, and who can provide wise counsel and professional guidance. Q: How have technology advances helped you as an educator? A: One resource that I personally really like and that has helped tremendously is our Interactive Television (ITV) system at the Interactive Learning Centers. A professor can conduct a live class at one campus (at the South Campus, for example) and students at either the North or the Central Campus (or both) are able to hear, see, and take part in the class because of the large-screen ITV audio-visual format. It’s really like all of the students, even those who are remote, are together in one big classroom. Any student, whether at the live session or at the remote session, is able to ask questions, make comments, and fully participate. Students like it because they can drive to the nearest campus, which cuts down on travel expenses. San Jacinto College offers real estate courses and degree plans at all three campuses. Morris holds a bachelor’s degree in biochemistry from Texas A&M University, and a master’s degree in business administration from the University of Houston. He has been teaching real estate at San Jacinto College since 1985. Morris and his wife Tina live in Humble, and will soon celebrate their 30th wedding anniversary. They have two sons and one daughter. A.J., 25, is a pitcher for the Daytona Beach Cubs, a minor league affiliate of the Chicago Cubs. Brad, 23, will soon graduate from the University of Texas, where he is studying petroleum engineering. Lauren, 19, is studying industrial engineering at Texas A&M University.